The Extreme Optimization Numerical Libraries for .NET contain extensive support for numerical linear algebra. To illustrate the range and versatility of the linear algebra classes, we created M#: the the .NET language for numerical computing. M# comes with a complete environment for linear algebra computations. The language (pronounced "M sharp") implements a subset of the Matlab language. Data types supported are boolean values, scalars, vectors, matrices and strings. It supports control flow constructs such as if, for, and while, as well as a large number of built-in functions. / Division, solution of linear system. \ Backwards division, solution of linear system. ^ Raise a matrix or number to a power. == ~= < > <= >= Relational operators. size Size of a matrix. repmat Tile a matrix horizontally and vertically. flipud Flip a matrix horizontally. fliplr Flip a matrix vertically. find Find non-zero elements of a matrix. tril Extract lower triangular matrix. triu Extract upper triangular matrix. Table 2. Supported array operations. sum Sum of elements in matrix columns. cumsum Cumulative sum of elements in matrix columns. prod Product of elements in matrix columns. cumprod Cumulative product of elements in matrix columns. Table 3. Supported matrix operations. zeros Creates a matrix of all zeros. ones Creates a matrix of all ones. eye Creates an identity matrix. rand Creates a matrix with random components. magic Creates a magic square. hilb Creates a Hilbert matrix. pascal Creates a part of the Pascal triangle..
linspace Creates a vector of equally spaced components. logspace Creates a vector of logarithmically spaced components. Table 4. Supported special matrices. det Determinant of a matrix. trace Trace of a matrix. rcond Estimate for the reciprocal of the condition number. lu LU decomposition of a matrix. qr QR decomposition of a matrix..
Table 5. 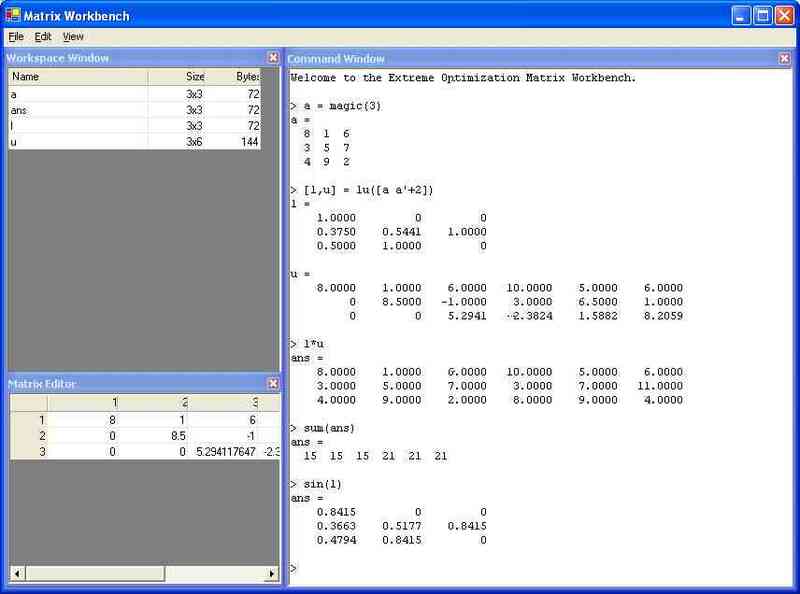 Supported linear algebra operations. blanks Returns a string of spaces. deblank Removes trailing spaces from a string. findstr Finds all occurrances of a string in another string. lower Converts a string to lower case. strcat Concatenates two or more strings. strcmp Compares two strings for equality. strcmpi Compares two strings for equality independent of case. upper Converts a string to upper case. Table 6. Supported string functions.